﻿﻿﻿﻿﻿I’m a rocker. While in college in the ’80s, I was a long-haired, head-banging rocker. I’m especially fond of power chords and intricate solos played on a six-string guitar, either electric or acoustic. That’s what I like — I guess I was born that way. My old rocker ears also enjoy the sounds of nature — whether from a frog, a katydid, wind blowing or water flowing — and my favorite nature sounds, by far, are bird vocalizations. Bird songs and bird calls are not synonymous terms. Their context is quite different. Bird song is complex, often seasonal and usually musical, and it involves advertising for a mate or maintaining a territory. Bird calls, however, are simple and usually not very musical. Chip notes are short calls given to announce food or just to stay in touch, and they’re used more commonly year-round. Within a given species of bird, we believe their songs and calls mean different things as they communicate. When humans communicate, air passes through a larynx, which creates simple sounds. When birds communicate, air passes through a syrinx or “voice box” and can produce something far sweeter. Guess which one is more specialized at producing a wider range of sounds? No offense to David Lee Roth or Mick Jagger, but it’s the one our feathered friends use. Like humans, birds have different regional dialects. Someone from Wisconsin sure doesn’t sound the same as a Georgia native. The same can be true of many of our birds. If you want to hear a variety of songs (in addition to those we’re providing), there are several worthy websites, including the Cornell Lab of Ornithology’s Macauley Library and the one we used for this article,www.xeno-canto.org. Arranged in random order, let’s “see” my Top Ten Bird Hits (and a few others), but be sure to “listen” to them as well. One of the sweetest songs and dearest to me, this sparrow sings the representative song of open pine forests that once occurred throughout the eastern third of Texas, where I live. Fire suppression and changes in forest management have nearly eliminated this bird from Texas airspace. 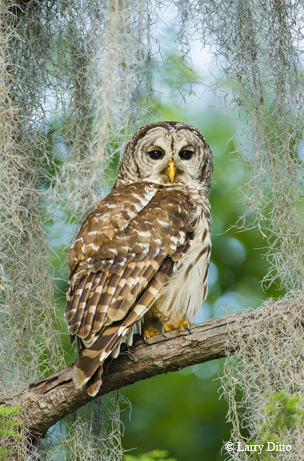 Along with the whistles of bobwhite quail, theirs was once a dominant song ringing through longleaf or shortleaf pine savannas thick with a healthy grass-forb layer. The last stronghold of the species in Texas is the longleaf belt that includes the south end of the Angelina National Forest, south of Sam Rayburn Reservoir. 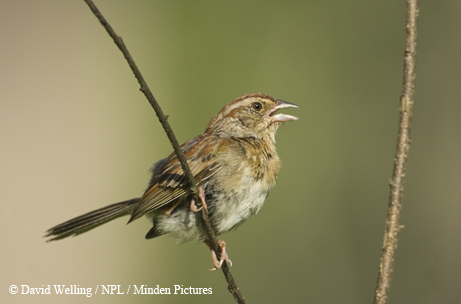 To hear a Bachman’s sparrow, visit that forest from early March through September. This year-round resident is not vocal during fall and winter. This bird sings one of my backyard favorite songs. It’s soft, melodic and very pleasant. It’s also soothing on weekends while I’m reading or snoozing on the couch with the windows wide open. Other than splashing around in our birdbath, brown thrashers have severe stage fright, usually retreating to the shrubs except when they sit up, fairly conspicuously, to sing aloud. 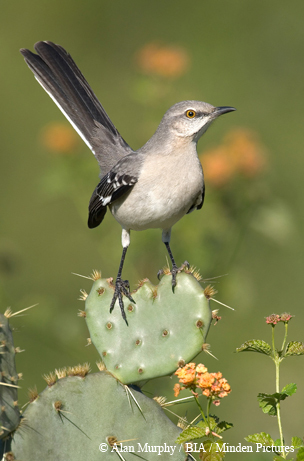 These mimics are related to our state bird, the northern mockingbird, but the thrashers imitate notes in duplicate and not triplicate like the mockingbird (or in singles like another relative, the gray catbird). Breeding thrashers live and sing in urban areas in the eastern two-thirds of the state. 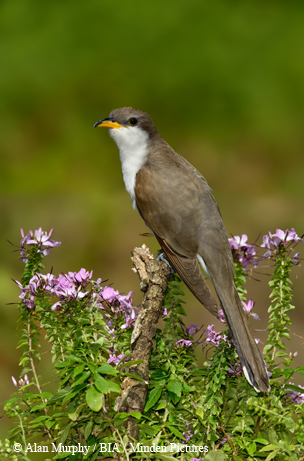 Old-timers refer to the yellow-billed cuckoo as the “rain crow.” The reasoning behind that colloquial name has swirled around a bit and lost its meaning. While most birds often get very quiet during a rain shower, these dedicated songsters often continue to vocalize. Some lore incorrectly states that when their coos are heard, it is certainly going to rain, so get your umbrella ready. Sorry, this bird didn’t go to meteorological school and cannot predict the weather. Yellow-billed cuckoos are one of the last species to arrive at their breeding grounds in Texas after overwintering in the tropics, which makes them part of the caboose in the long train of migrating species. Listen for them in mature woodlands, where they’re fond of tent caterpillars. I’m tickled when I hear this bird. As the name may suggest, it sounds as if it’s having a chat or conversation with another. Short bursts of varying squeaks, chuckles, squawks or rattles are followed by short pauses as if the birds are listening for a response. 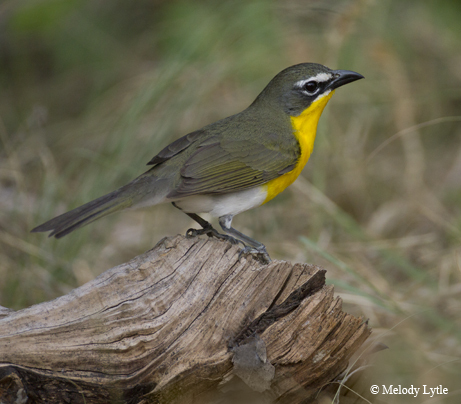 Listen for yellow-breasted chats in the thickest shrubs. If you’re lucky, you’ll see one do his magnificent butterfly-like flight — he puffs up and continues to sing while flying from perch to perch, or straight up in the air as if showing off muscle and song all bundled into one fluffy yellow ball of a great bird. Caution is advised to biologists and landowners charged with surveying birds: This species does a great job mimicking vocalizations of other birds, especially crow caws, bobwhite whistles and pileated woodpecker clucks. They “chat” the most in old fields or regenerating clear-cuts in the eastern part of the state or thickets of scrub and streamside areas out west. 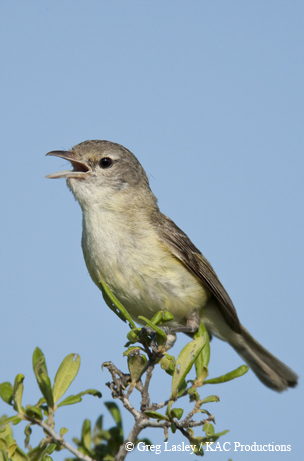 The Bell's vireo lives in thick shrubs and brush in various parts of the state. Its song reminds me of an old man griping and whining about something upsetting. If you’re lucky enough to spot these thicket-loving birds, there’s not much to see, as their colors are subtle and drab. They make up for it, though, in a busy, hurried song played on repeat mode. These migrants, which leave us during the colder months for warmer climates to our south, return to thickets across various parts of our state with a vengeance, even though they are quite vulnerable to nest parasitism by cowbirds. This vireo reaches its mother lode in the shrubs along waterways in the Trans-Pecos, especially in the Devils River watershed. This is a bird of bluffs, cliffs, canyons and rocky outcrops in the western half of our state. 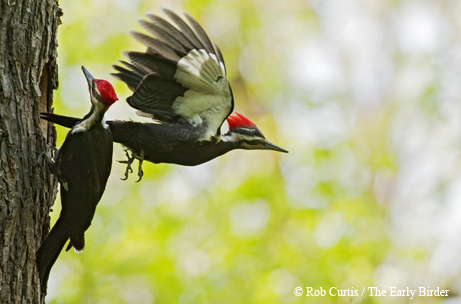 You’ll need good luck to see one, but you can’t miss the incredible sounds of its remarkable descending song. Like me, this bird is a rocker! 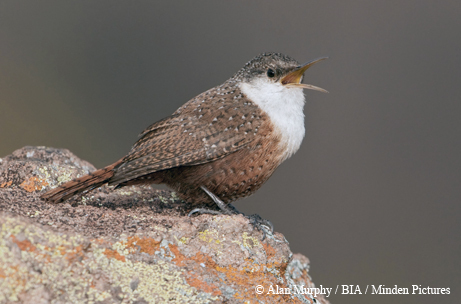 Canyon wrens hop around in search of insects, nest among the rocks and bob up and down while vocalizing from the top. And, like singers in rock bands, they often achieve great echoes while singing away through the canyons. The farthest east I’ve ever heard one is the Barton Creek greenbelt in Austin. This little wren might be the most versatile and complex songster of the bunch. The bird reminds me of the late Freddie Mercury, who sang an array of highs and lows for the band Queen. 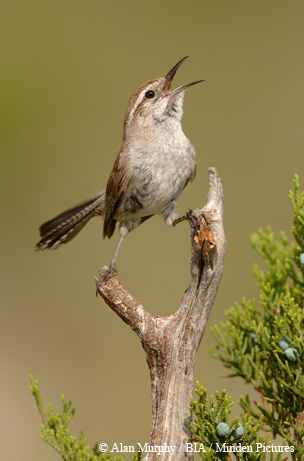 While the Bewick's wren is fairly drab, its song is absolutely wonderful and the one I miss most when leaving the western half of the state, where this bird can be found in thick vegetation. Be sure to pronounce its name correctly, like the Buick car. Spend some time listening to one as he changes things up after a spell, maybe in order to hold the attention of others. I know it works for me! Dickcissels are often heard in grasslands of mostly native grasses and forbs, and many males together sound like a cacophony of high-frequency whistles and chips. Most of these highly migratory birds winter in the llanos (or plains) of Venezuela but return to grassy areas in Texas and much of the Great Plains to settle down and raise a family. As our larger grasslands get converted to other uses and whittled down in size, so die the sounds of so many grass-loving species, from prairie-chickens to several kinds of sparrows. 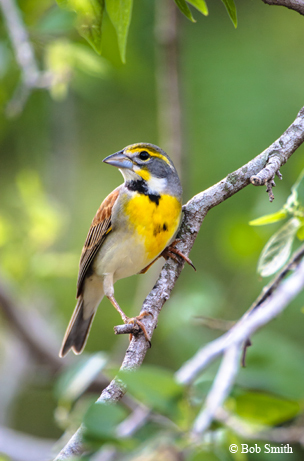 In order to keep the buzzy sounds of dickcissels ringing aloud, conserve and protect the native grasses found on your property. 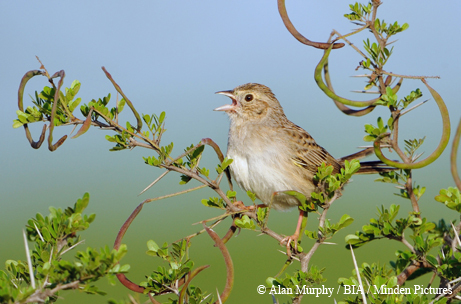 Two words come to mind when describing the song of the Cassin's sparrow: bouncy and almost eerie. A challenge for Eddie Van Halen would be to transcribe this avian tune to guitar and perform it. The appearance of these sparrows is often cyclical due to rainfall and habitat conditions, but they typically reside in grassy areas mixed with shrubs. Shrubs are the stage from which the birds sing and, if you’re lucky, do a dance known as “skylarking,” or fluttering skyward while singing. Their colors aren’t jazzy, but their showmanship commands attention — you’ll be hoping for an encore. They can pop up almost anywhere, but the Cassin’s sparrow’s roots grow deeper the farther west you go in the Lone Star State. 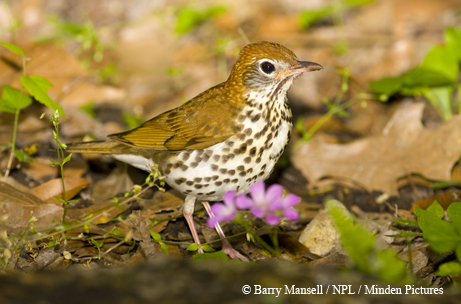 If you want to know which bird sits (or sings) at the top of my list, the wood thrush is it. I don’t admit to having one favorite rock singer, but in the Texas bird world the wood thrush rises to the absolute apex of sound. In graduate school, I rented a simple house tucked into the woods that, unbeknownst to me, included a singing male who never failed to perform each and every day during the breeding season. It’d almost be dusk in May and June and he’d still belt out those lovely ee-oh-lays that always took my breath away (rhymes like a song, eh?). Want to know my global favorite bird song, outside of Texas? 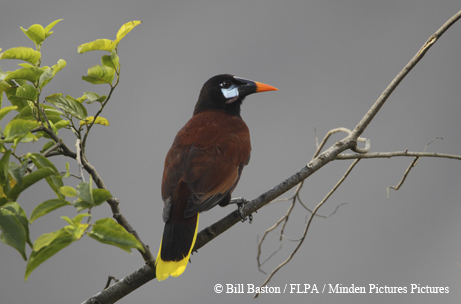 Without question, it goes to the Montezuma oropendola of Central America. They’re not only great to hear but also fun to watch as they vocalize. I’ve heard them in at least three countries, but the species does not range into Texas, so you’ll have to get your passport ready to find one. How can I leave off the bird that “hooked” me into birding when I was a kid growing up here in Texas? Every time I hear one, I’m forever appreciative of the door into nature that opened up for me. A romantic bout of owling from this bird was the soundtrack to one of my first dates with the woman who is now my wife. Who isn’t impressed when a super-charged and excited pair of these owls begins to emit their monkey-like calls? 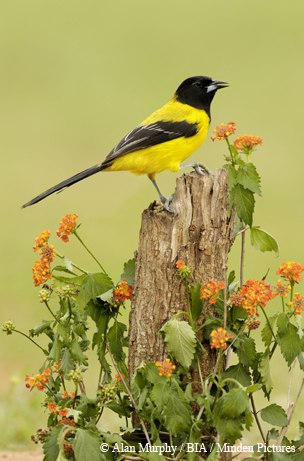 You might think you hear a human whistling away in the South Texas brush, but it might really be this yellow-and-black oriole. While most bird song occurs during daylight hours, some avian rock stars sleep late and get on stage in the midnight hour. Here are two that sing while you sleep. This bird of the night reminds me of when I lived part of my adult life in Austin. 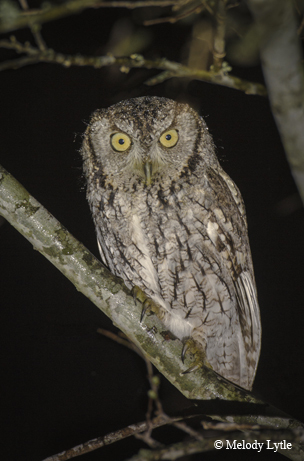 Sleeping with the bedroom windows open during cool winter or spring nights often allowed for pleasant sound bites of this owl. One day, a woman called me and asked if I could tell her what sounded like a “pony in her tree.” I chuckled and, without hesitation, knew precisely what was delivering those “whinny” notes! I’m unsure what early ornithologists were thinking when they named the eastern screech-owl, but the modifier “screech” is definitely not applicable. Oak woodlands and oak savannas of the Hill Country are where I’ve heard them most. 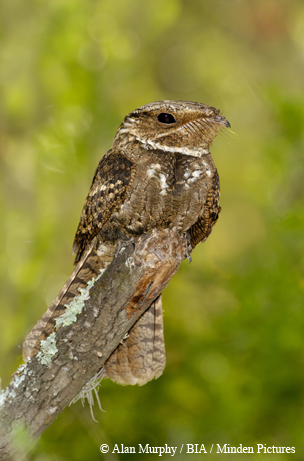 No other night bird in Texas is more misidentified than this one, thanks to various literary works that mention the night sounds of the eastern whip-poor-will, a species that only migrates through Texas. 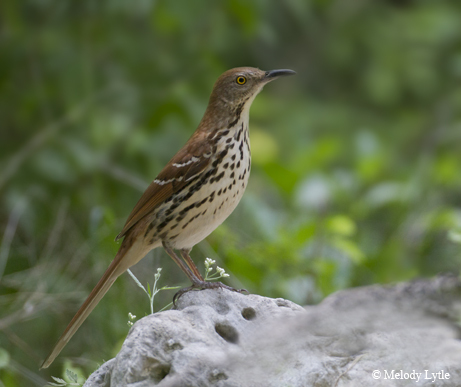 Despite what Grandpa taught you, the bird you hear in the eastern half of Texas during the hot summer months is the “Chuck” and not a “Whip.” Pleasant when heard farther off, this song is representative of dark skies and denser forests. The bird “says” its name, but don’t expect to hear the first note, the “chuck,” if it's far away. Often all that registers is the wills widow, wills widow over and over again. Find a remote forested area without many lights in order to get closer so you can hear that sharp first note. I’m sorry to report that there are some songsters that annoy me, even if I love them. In short, I’m a little bit like Goldilocks: I like sounds that are “just right” and not too loud, not too incessant and, like the latest hit song, not overplayed on the radio. 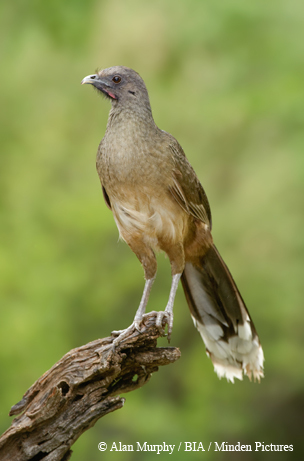 While sleeping in a tent at dawn, I found that a group of raucous plain chachalacas was worse than any alarm clock. Great sound, but not while you’re asleep! 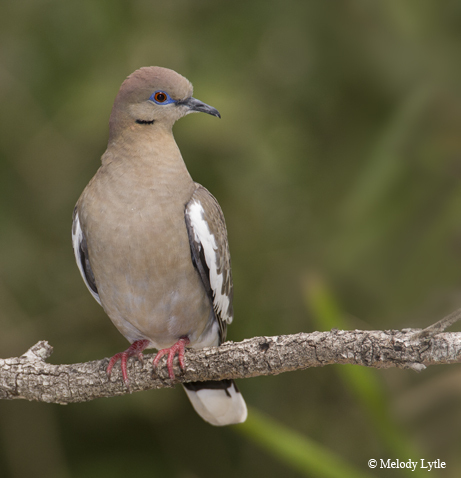 In an urban setting, incessant white-winged dove cooing really drowns out all other sounds. 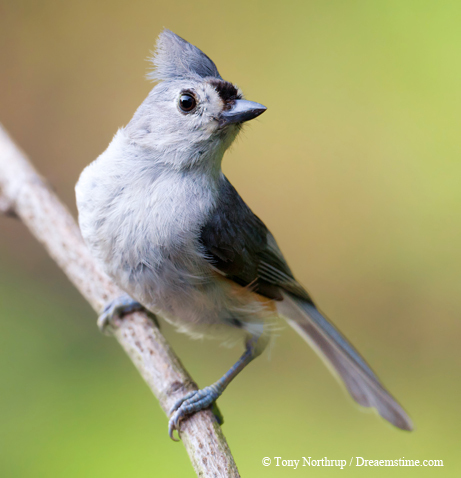 Trying to conduct a bird survey under a tufted titmouse’s loud "Peter, Peter, Peter" song is tricky. Turn down the volume, Mr. Northern Mockingbird. Enough said! 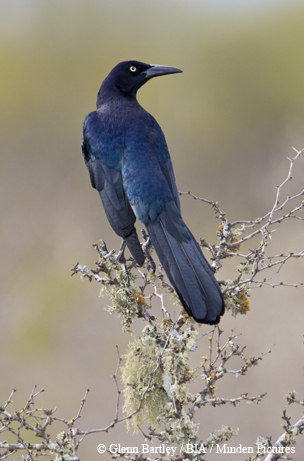 Massive roosts or nesting colonies of great-tailed grackles will fill your ears with some rather cacophonous sounds. Until recently, an article like this would have been composed just of words that tried to describe the birds’ songs. Lucky for us, we can now link to the recorded songs for your listening pleasure. To hear the bird songs visit tpwmagazine.com/birdsongs, or download the app version of this issue from the App Store (iOS only).